For some time I have been thinking of building some benches using plantation grown Hoop Pine.For all the good reasons of sustainability and secure supply of timber.Of course Hoop does not have the surface hardness of tropical hardwoods but it should make a very serviceable bench top.It may build it’s patina a bit quicker but that is not really a problem as long as the flatness is maintained.I don’t think anyone would actually be able to wear a bench out in their lifetime. 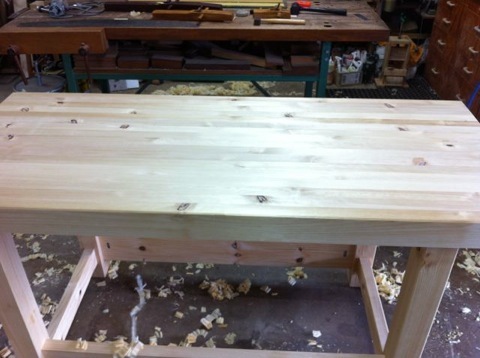 This timber is graded to be clear of knots on one side and usually edges so for bench building it is fit for purpose. 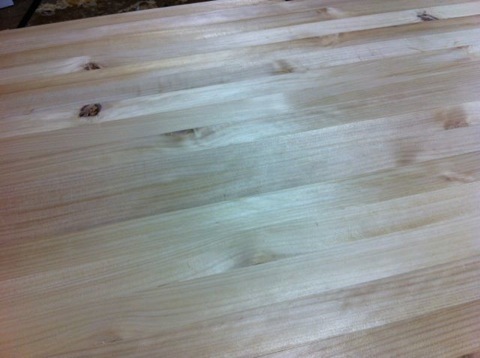 Seeing some knots on the under or inside does not bother me.Hoop machines quite nicely and the finish off the hand planes has a lovely shine as can be seen in the photos of the bottom side of the bench top.The top is free of knots and is yet to be planed.The benefit of being easier to work is obvious. I have a few more surprises to come as this bench gets it’s hardware so stay tuned. 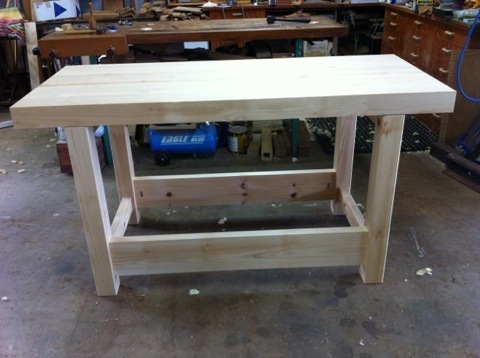 Unfinished bench.Size of 1780 x 750 x 950mm high. HNT Gordon wooden planes to smooth and flatten. Close up of the underside.A lovely polished look straight of the plane.